Going through a blocked spell. When I’m hot, my brain sizzles and I can’t think right. It’s a late bloomer. You can just see the start of some faint blue in the blossoms. Actually, as the day progressed today, the blue has come out even more. I am amazed at how many blooms are on this thing. 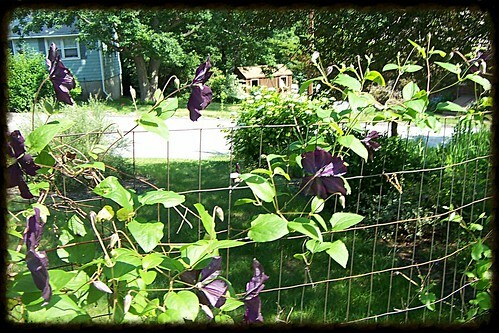 The clematis that we planted a couple of years ago along the wire fence is surviving and blossoming. We’d like to cover that whole fence with this stuff. Just need for Paul to get some free time… is all. Then Sandy and I found a way to do stuff with photos, and I made this mosaic of a photo of the dogs – it’s completely made up of about 450 of my photos of “cats and dogs” from my files… I’ve linked where you can find this site and make your own if you like. I’ve only made this one but plan to do more. I’d like to print one up, too. If you press CNTRL and + it should enlarge it on your screen… then just press CNTRL and – and it will go back. You can actually see all the tiny little photos up close. The one above,the collage, was made with the pizap.com collage maker. Just put in your photos – loads of frames and things to choose from and it’s free. We’ve had reasonable temps for the last 3 or more weeks. Then last night we finally turned on the A/C, when the temp inside suddenly hit 81. Today, it really warmed up. Temp was in the mid 80s with the humidex near 100! The one bright spot there was it was cloudy, so no sun beating down on us. 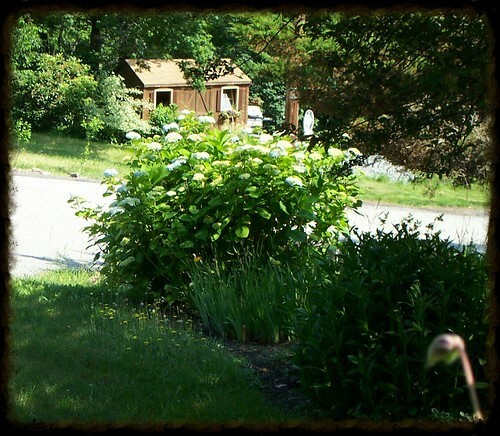 That’s the one thing that made it relatively livable – but we definitely have the A/C on today. Once you get this to show up, enlarge the page to a full-screen size, then press “CNTRL +” a bunch of times til it gets real big and you will see the little photos. 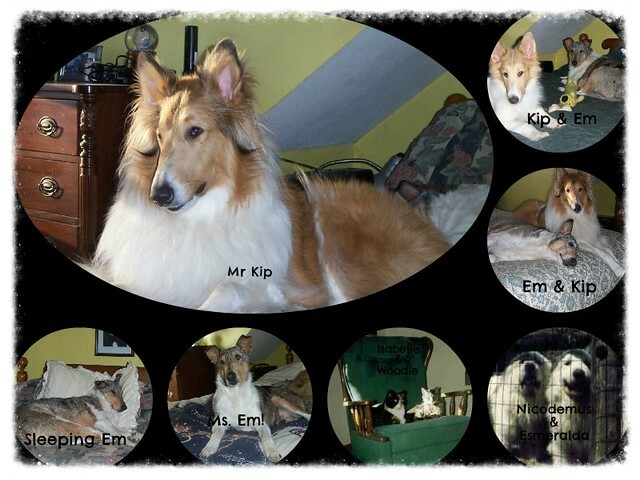 I realize you can’t really make out every little tiny photo but you can get the gist of it. 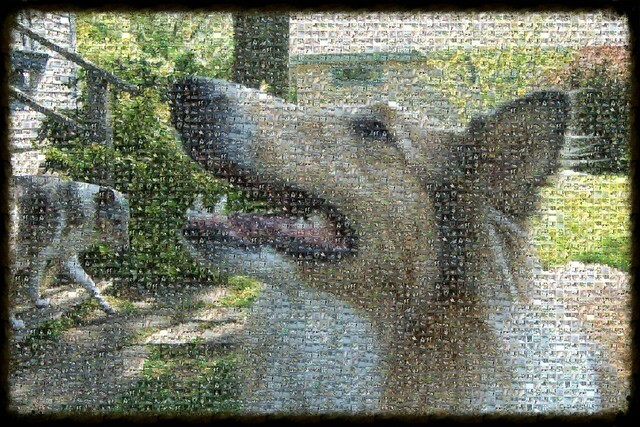 I enlarged the mosaic but could only see the two dogs. Warmer here than usual this week, but we have very little humidity. Yea, heat wipes me out too! I know just what you mean. When it gets too hot, my brain turns to mush. It’s as though everything short circuits. Maybe it is time to turn on the A/C. 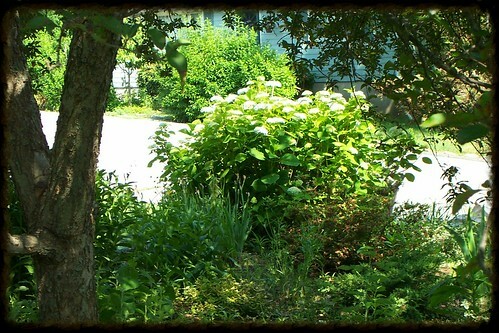 Your yard is such a joy to view…thanks taking time to show us. Glad you put the photo sites in for all to enjoy. Hi Em… so nice to see you back here online again. I don’t do well in the heat. I melt very quickly and need a cool breeze to be resuscitated again. That hasn’t happened yet today… it is just too darn hot. We have been having a warm streak but I am glad that open windows do the trick.